Patricia Espinosa, the new head of the U.N. Framework Convention on Climate Change. Photo courtesy of the United Nations. NEW YORK — The woman tasked with guiding the aftermath of the Paris climate deal said yesterday that concerns abound about what a Donald Trump presidency could mean for the global agreement. In an interview with ClimateWire at the start of her first annual high-level climate change discussions here, U.N. 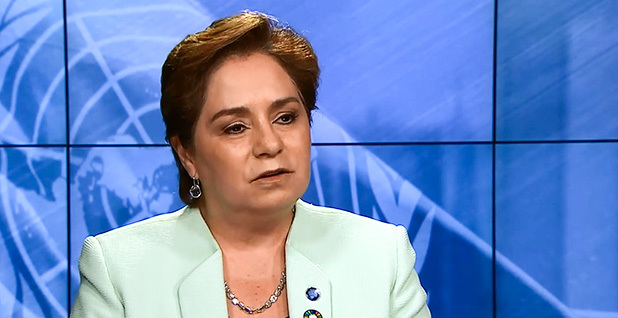 Framework Convention on Climate Change Executive Secretary Patricia Espinosa said the GOP nominee's pledge to "cancel" the Paris deal is a major topic of discussion in global climate circles. "I think everybody's aware of that possibility and just concerned about it," she said. But Espinosa also added that the way countries respond to any bid by Trump to withdraw the United States from the deal inked by 195 countries would determine whether its consequences would be far-reaching. "What would happen? What would be the reaction of the international community? What would be the reaction in the U.S., where today most U.S. citizens believe climate change is real and something has to be done about it?" Espinosa asked. "It's important that we're aware that it would be a very, very complex situation." Espinosa spoke as diplomats gathered for the start of a new U.N. General Assembly meeting — and for a ceremony tomorrow hosted by U.N. Secretary-General Ban Ki-moon aimed at encouraging countries to ratify the Paris Agreement early to ensure that it takes effect this year. Approximately 30 countries are expected to deposit their instruments of ratification during a one-hour gathering at U.N. headquarters. The 2016 timeline would secure Ban's climate legacy as he prepares to step down in December after years of prioritizing the climate negotiations process. It would serve a similar function for President Obama, for whom Paris is also a crowning international achievement. The United States formally joined the Paris Agreement last month alongside China. Now that it has done so, it cannot withdraw for at least four years — provided the agreement is in effect when the next administration takes office. Espinosa said yesterday that it is "possible" that tomorrow's gathering will see enough countries ratify Paris to allow it to take effect. The deal enters force when 55 countries totaling 55 percent of the world's greenhouse gas emissions are parties to it. Both thresholds are within reach — though it seems likely that the emissions requirement will take a few more weeks to fulfill. Large emitters including Japan and Canada are expected to join very soon, while India and the European Union haven't made promises but are weighing their options for swift ratification. Espinosa's native Mexico will join the Paris deal tomorrow after legislative approval. The former foreign minister recorded a personal video message to the Senate ahead of its vote, imploring it to act quickly. Since taking the helm of the U.N. climate body two months ago, Espinosa and her secretariat have been planning for the possibility that Paris will be in force before the next round of U.N. negotiations. That November meeting in Marrakech, Morocco, could become the first conference of the parties to Paris, kicking off negotiations on a host of rulemakings for the deal's implementation years before its framers expected. This first meeting would be "procedural," Espinosa said, but parties would likely move to buy other countries time to ratify the deal and weigh in on its implementation. One way to do that would be for countries that have already ratified Paris, including the United States, China and Mexico, to agree to entrust the basic rulemaking work to the full Conference of the Parties to the UNFCCC in early years — allowing non-parties time to act. There might be some deadline by which time decisionmaking would revert back to the countries that had ratified, she said. "Of course we want a universal agreement, and we want a universal application," she said. "So it would be important that we have a very inclusive process." Espinosa said she learned the value of inclusiveness when she traveled to Copenhagen, Denmark, in 2009 with Mexico's then-president, Felipe Calderón, to attend the climate talks there. The summit that year was marred by a closed process and rumors that the Danish conference presidency was circulating a secret text to some parties but not others. The talks went into extra innings and then broke down completely without producing the looked-for agreement. The entire negotiations process was in doubt as Mexico prepared to take its turn presiding over the next round of talks in Cancun, Mexico, the following year. "When the time came that we had to start preparing for [Cancun], and trying to rebuild trust and trying to set the stage so that everybody would be comfortable and we'd be able to deliver some kind of result, I was very involved from the beginning talking to my colleagues in the different countries," Espinosa said. Because of Espinosa's past experience in multilateral processes and because the climate talks were now such a delicate diplomatic process, Calderón made the unprecedented move of tapping his foreign minister to preside over the talks rather than an environment minister. "So that was like a crash course into climate change," she said. Espinosa got high marks for her performance in Cancun, which among other things established the $10 billion Green Climate Fund to help poor countries cope with warming. Many analysts say that conference went a long way toward re-establishing countries' trust in the U.N. climate process. "We innovated a lot in the way of negotiation, in the way of making consultations," she said. "We made a very open process that had not been the case before. "If I would need to say in two words what was the reason for success, it was 'inclusiveness and transparency,'" she said. Those principles, Espinosa said, have generally guided the talks ever since; she advocated them to former French Foreign Minister Laurent Fabius when he was preparing to preside over the Paris summit. And she said they will now guide her work at the helm of the UNFCCC. "I think she's exactly the right person for the moment," said Rachel Kyte, CEO of Sustainable Energy for All. Kyte remembered the Mexican delegation engaging with countries well in advance of Cancun, with everyone feeling they had their "three minutes" with Espinosa and then-UNFCCC Executive Secretary Christiana Figueres, she said. The extra work paid dividends, Kyte said. "She was trusted." Espinosa was also "tough," Kyte recalled, gaveling down the agreement at the close of Cancun despite objections from Bolivia that might have prevented it. This year, the world's attention pivots from celebrating the deal 195 countries reached last year in Paris to implementing it, and Espinosa has a to-do list for Marrakech that goes beyond writing ground rules for the agreement. Another focus will be helping developing countries gain the capacity to deliver on their pledges toward Paris, she said, including with financial assistance from developed countries. It's also important to better integrate the actions being taken by non-state actors like cities, subnational governments and the private sector — known collectively as the Global Climate Action Agenda — into the more formal nationally determined contributions of Paris, she said. "We want to bring all the action that is happening on the ground closer to the intergovernmental negotiating process," she said.